Following a hectic couple of weeks, I have just found some time to reflect on another exciting trip to India. My visit to the Country allowed me to meet some of our partners in Kolkata and Delhi which were both inspiring and fun. The combination of energy, excitement and high academic purpose was wonderful. The joint conference I helped open at the University of Calcutta used humanities research to explore important medical, social and cultural issues. I was particularly impressed with the talk given by Vice Chancellor Suranjan Das which combined careful methodology with great insight. It was very good to see Suranjan so soon after his successful visit to Edinburgh for the opening of our India Institute. 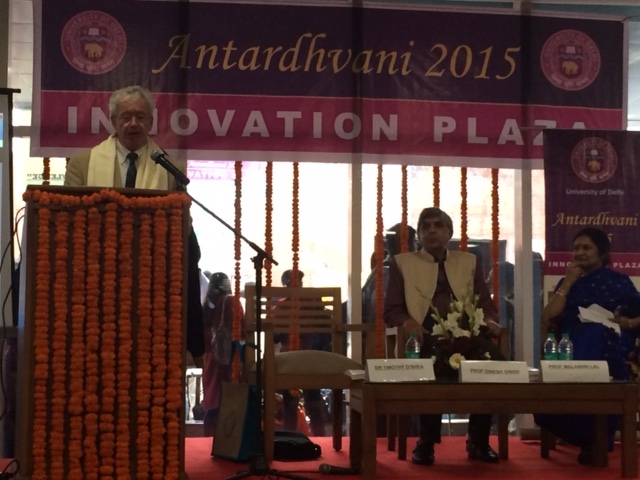 I then traveled to India’s capital, where I was honoured to open the Innovation Plaza at Delhi University. I was overcome by the volume of high quality student work on display, produced by hundreds of undergraduate students working in groups of up to ten. Identical in intent to our Innovative Learning Week at Edinburgh, but bigger, brighter and with bags of bustle. Vice Chancellor Dinesh Singh has led many interesting developments in supporting student learning and I am very pleased that we are a partner in some of them. Dinesh is a towering figure in the world of Higher Education, a prominent mathematician and a close friend. It is fitting that we awarded him an honorary degree last summer in Edinburgh. Signing a Memorandum of Understanding with NUEPA (the National University of Educational Policy and Administration) built on the previous successful engagement with Rowena Arshad, Head of Moray House School of Education. It provided me with the opportunity to debate leadership models in education with a very lively group of NUEPA colleagues. The last few weeks have seen so many very different and positive engagements between leading Indian institutions and my colleagues from Edinburgh. Amrita, Director of our India Office in Mumbai, and her colleagues are playing a blinder. I really enjoyed my visit, I was delighted with all that my Edinburgh colleagues are doing in India and I am really looking forward to my next visit. « Week 3: How did our ‘pop-up University of Edinburgh in India’ go? India and Edinburgh – a shared genetic research future?